Of all the titles that DC Comics is about to cancel around Convergence, I think the cancellation of Batwoman gave me the most pause. No offense to current Batwoman writer Marc Andreyko -- whose Manhunter series I'd still put on anyone's DC Comics required reading list (hey DC, how about a New 52 revival of that?) -- but perhaps the only thing that mitigated my disappointment over Batwoman's cancellation is that JH Williams and Hayden Blackman are no longer the team on Batwoman, and I'm not sure if the book can be quite the same without them, and especially without Williams's art. Case in point, while I enjoyed the second Batwoman volume's story well enough even despite the guest artists (and especially on my second read), Batwoman Vol. 3: World's Finest, with Williams's return to art duties, is really something exceptional. Surely Williams and Blackman's writing plays a great role, effortlessly and vividly bringing to life the voices of Batwoman, Wonder Woman, even bizarre mythological creatures, but Williams's art here is second-to-note, especially in the one- or two-page individual-character sequences. Arguably no other book has been so readily filled with spreads suitable for framing. In all, Williams and Blackman continue to challenge the preconceived limits of what a Batwoman story can be, delighting the eyes all the while. 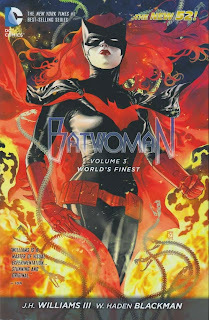 Williams and Blackman have succeeded in offering three Batwoman collections thus far that all stand on their own, but each of which expand the scope of the larger story (reminiscent of six seasons of Lost). In the first, Batwoman sought one pseudo-supervillain, the Weeping Woman, alongside the Gotham City police department; in the second, we learn the Weeping Woman is part of the Medusa criminal cartel, and Batwoman takes on more enemies and a more global threat alongside the governmental Department of Extranormal Operations (DEO). In World's Finest, we come to understand now that "Medusa" is the mythological Medusa, and the scope of Batwoman's challenge grows to the supernatural and requires now a team-up with a full-fledged superhero, Wonder Woman. By the last chapter, issue #17, one feels as though they've read one truly epic story, but the rising action and denouement in each book is so clear as to avoid the fatigue inherent in other long tales. And while I'm not generally a fan of the Bat-family fighting the supernatural (and the conclusion, with a gargantuan monster tearing down Gotham, is hard to reconcile with the absence of such in the other Bat-titles), the writers have layered the stories so well that by the time we reach the third book, the mystical developments seem only natural. Though wisely, I think, it seems like Williams and Blackman intend to contract with the next story, pitting Batwoman Kate Kane against an internal, personal challenge instead of an external one, which seems the right way to go after they've demonstrated that Batwoman can stand toe-to-toe with the gods and that the Batwoman character allows for it. In many ways World's Finest is structurally similar to Batwoman Vol. 2: To Drown the World, in that it tells a variety of individual characters' interconnected stories, though in World's Finest those tend to overlap a bit more on the same page. The tone is at least the same, in that we get Batwoman's perspective, and Maggie Sawyer's, and Jacob Kane's, and Bette Kane's, aka Flamebird. I think the name and costume that Bette takes late in the book, Hawkfire, are each purposefully atrocious -- contrasting Bette's uber-superheroics versus Kate's laid back approach -- though the writing is subtle enough that it's hard to know for sure; I'd appreciate if the writers might get into Bette's New 52 history pre-Batwoman, but I don't think they will. Structurally, the writers also surmount a couple hurdles that have brought down other books, namely the requisite Zero Month issue and the need for a fill-in artist. The writers dub the Zero Month issue "Interlude I," and re-tell Batwoman's origin in the guise of a letter Batwoman is writing mid-mission to find Wonder Woman, such that indeed the story is an interlude and not a sudden break in the forward action. As he has before, Williams does his best David Mazzucchelli impression in revisiting Kate Kane's "Year One," and that's always fun to see, interlude or not. Trevor McCarthy draws almost the entirety of "Interlude II," which spotlights Detective Maggie Sawyer's struggles in medias res (a Maggie Sawyer series is something I'd gladly read, or read again since Gotham Central). Giving McCarthy his own issue semi-separate from the main plot works considerably better than the distracting mishmash of artists in To Drown the World. Batwoman's final page revelation of her identity and proposal to Maggie is perfectly in-character and earned in the story. One has no guarantee that Maggie will say yes, of course, and in fact, given Maggie's distrust of Batwoman (despite her former friendship with Superman, if that's still in continuity), it's probably all the more likely that she'd say no, or at least there would be trouble ahead. This is the equivalent, essentially, of Batman marrying Commissioner Gordon, the kind of vigilante/police relationship we haven't seen in DC Comics near as I can recall, and so the storytelling possibilities are quite intriguing. Still, inasmuch as I favor this relationship, I did have to concede DC's point that married characters are to some extent the antithesis of the New 52, in that they want to expand and not limit each character's story potential. And, perish the thought that Maggie and Kate should marry and then some other writer finds the marriage too restricting and therefore Maggie's killed off just to free the character; better that the marriage just not happen. Kate and Maggie's status as one of DC's few homosexual couples complicates things, though one neither wants to see LGBT characters in the DC Universe pigeonholed as being always monogamous nor, on the other end of the spectrum, always promiscuous. Of course this would be easier to navigate if Kate and Maggie weren't two of only a handful of LGBT couples in the DCU. Given my ambivalence, I'm interested to see Kate and Maggie's relationship play out along it's natural course, whatever "natural" might be given both the editorial intercession, the change in creative teams, and now ultimately the book's cancellation. If you can set all the background noise aside however and focus just on the book itself, Batwoman Vol. 3: World's Finest is quite enjoyable; I have some sense, without having read volume 4, that it might be the best of JH Williams and Hayden Blackman's run on the series. If it weren't for Sandman: Overture, maybe the promise of more gorgeous JH Williams III artwork to come would have persuaded DC to keep him and Blackman on the book, regardless of their creative differences with editorial. The way their run abruptly ends on a cliffhanger with issue #24 is truly disgraceful.